Mundine V Green 2 Round by Round: Adelaide Oval, Adelaide, Australian National anthem sung by Jessica Mauboy as the lead in to Anthony Mundine (47-8) V Danny Green (36-5) 2. First bout between the pugilistic enemies was won in a walk by Mundine in a boxing masterclass. Anthem finishes, crowd lets out an excited roar of anticipation! Excitement is palpable. The figure of 30,000 in attendance has being mooted and it sure looks like a packed house. Mundine ring walk, painted Aboriginal warriors lead Mundine out in reflecting the pride in his indigenous heritage. The Adelaide crowd are expected to give Mundine a hard time because of comments he made about the historical subjugation of his people and they do exactly that. In Mundine’s corner his father Tony and Roy Jone’s Senior (father of RJJ). Danny Green ring walk. He looks primed, ready to go. At 43 years of age he’s one year Mundine’s senior. Eleven years on from their first fight that left a bitter taste in his mouth he’s here to even the slate. Word on the boxing beat is Angelo Hyders has pushed Green to the limits and got Green in magnificent shape to be able to take Mundine into deep water and drown him. Stare down, Green all business, Mundine relaxed. Both men retire to their corners to go. Bell rings, it’s on! Please note: Round by ground is written on the fly. Apologies for any spelling or grammatical errors. Green coming forward. Green throwing with intent looking to assert himself. Green pressing Mundine back against the ropes, digging. Ref parts them, Mundine lets one go on the break, catches Green! Green wobbled! Wobbled bad! Stumbling back against the ropes. Mundine going to get disqualified for a late shot? They are giving Green time to recuperate. Both camps confused! Mundine deducted a point! Green trying to clear his head. Green’s indicated he wants to box on. He is actually allowed a full 5 minutes to recuperate and should use it! He was shaken badly! Commendable Danny Green, warrior from his big toe to the top of his head. Fights back on, no 5 minutes taken. Mundine fires out a good jab, looking to fight from a distance. Mundine coming forward, Green backing up. Still recovering by the looks. Huge point of controversy the shot on the break. Mundine appeared to be in control using his skill but the point deduction tipped it Greens way. Green comes out firing, taking the fight to Mundine, Mundine stays composed. Works his way back to mid ring. Mundine working off the jab, Green pushing up on Mundine stalking. A dirty exchange, Mundine complaining about something, ref dresses both fighters down for fighting dirty as they glare at each other. Green looking to bull his way forward. Mundine’s game plan is work off the jab looking for the right hand. Green’s game plan to back Mundine up against the ropes and rough him up with his power advantage as the naturally bigger man. Green aggressive, Mundine’s skills working off his jab more effective. Mundine working off the jab but not using it enough. Green pushing forward, Mundine letting him. Green fires to the body, another shot looking to flatten Mundine’s tires. Both men look in impeccable physical condition. Poster boys for post-40! Mundine fires out a well timed jab catching Green pushing forward but not doing enough to dissuade Green. Close round, both men had their moments. Green pushing forward. Mundine keeping distance. Mundine’s jab starting to mark up Greens face as he continues to pepper it with his jab…but sporadically. Should be doing more with his jab, rinse and repeat Xs lots because it works when he does. Mundine looks composed mid-ring. Green is trying to make the fight, doing more to initiate while Mundine is shopping for a big shot, that big shot looks to be the right hand over the top of Green’s jab. Mundine spending to much time shopping and not buying. Green sends a couple of shots to the body. Mundine’s jab is consistently finding a home now. Three punch combo landed by Green, Mundine replies in kind. Green landing some good shoots. Mundine still composed. Mundine shopping for the right hand. The size difference that was spoken about before the fight giving Green a 20 pound weight advantage at fight time doesn’t seem apparent. Both men look evenly matched in the physical stakes. Mundine letting Green work, not doing enough to dissuade him from pushing forward. Green lands with a good right hand to Mundine’s head. Mundine replies with a right hand down the chute! Good round for Green thus far. Green round. Busier. landed the more decisive shots. Mundine, hands parried high. Green trying to double up on the jab. Mundine not overawed by Greens aggression. In fact it doesn’t appear as if he has a power advantage. Mundine nearly clips Green again on the break. Green turning his body sideways on the break is causing confusion. Mundine looks purposeful but not doing enough. Green misses with a big right hand but catches Mundine with a beautifully timed jab on the bell. Mundine needs to stop being tentative. Mundine coming forward. Not what many expected. Green is building points with his more consistent work, Mundine looks to be shopping for a big shot. Mundine catches Green with a couple of big shots, a big right, Mundine caught with a right hand himself. Did it hurt Mundine? Green throws an elbow, ref sees it! Ref is deducting a point! Wow, point deduction! Both men have now had a point deducted. Mundine clips Green with a couple of shots to the head and they rattled Green’s cage. Both show they can hurt the other! Mundine round with the point deduction, landed the more decisive shots in any case. Green pushes forward, doesn’t land anything of substance. A good exchange follow, both men land right hands, Mundine pressing, Green punches his way out of the corner. Danny Green sucking in big ones. Mundine looks fresher. Mundine pressing forward shopping for a big shot, throws a flurry of unanswered shots, a few find home. Green fading! Mundine with a nice jab. Mundine looking crisper, fighting with more intent, more assurance. Mundine coming forward, landing the more meaningful shots. Tony Mundine tells his son he can stop Green in this round. Mundine coming forward, Mundine pecking with his jab, pushing Green back. No one picked Mundine to be the aggressor pre-fight. Mundine now hunting Green looking for the stoppage. Green lands a right hand over the top bulling Mundine backwards. Green lands another right hand, another. Mundine comes back with a strong flurry, landing big! Green has more heart then an abattoir! Mundine throwing haymakers looking to end it! Great finish to the round. Both men landed well, Mundine landed more. Both fighters embrace mid-ring, nice gesture on their part. 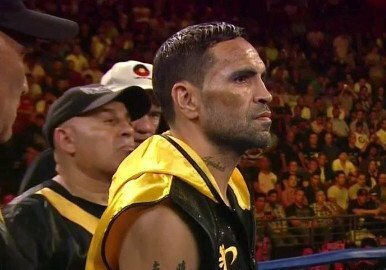 Mundine pressing forward…jabs, and well. Mundine gets caught with a right hand. Mundine loads up, comes up short, Green’s nose bleeding badly. Mundine stalking but not pulling the trigger. Lands with a nice right hand as I write that. Nothing to define the round by either man to this point. Mundine a 1-2 down the chute. Neither man put an exclamation mark on the round. Not much happened but Mundine round for mine for the fact he pushed forward finished stronger. Green called the winner by majority decision! The judge who scored the fight 98-90 in favour of Green should have his judges license revoked, his eyes, bank balance and mental faculties plumbed and checked. A phenomenally bad card and totally out of proportion with the totality of the fight. On the basis of the 98-90 sore card that judge has Green winning nine of the ten rounds and that’s absurd. Mundine is not happy and for good reason. He appeared the more composed fighter, the more skilful fighter that landed the more meaningful shots. Green’s hoisted up on the shoulders of his team. An angry exchange is taking place between Khoder Nasser Mundines manager and Danny Green, profanities are flying. Team Mundine are livid as they exit the ring and they’ve got an argument but the fault does not lay with Danny Green, he’s a fighter not a judge. Much more to follow re this contest and while it wasn’t pretty it was a fight in every sense of the world. Commentators are lambasting the judges decision. Three of the four judges think Mundine won. But ultimately not on the cards where it counted.